The Organization for Economic Co-operation and Development was the first international organization to launch a social monitoring program in the 1970s. Since then, systematic efforts have been pursued by various OECD Expert Groups, Committees and Directorates to broaden the scope of social monitoring and increase its policy relevance. 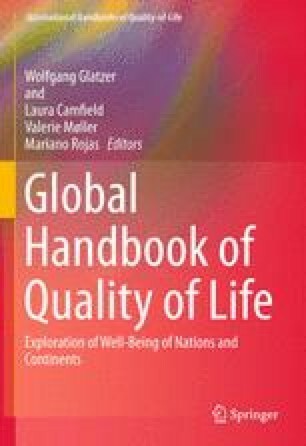 This article reviews the first OECD works on quality of life as well as more recent efforts, including the publication Society at a Glance that has exclusively focused on the social dimensions of wellbeing The article then describes the broader wellbeing and quality of life reporting activities that the OECD has put in place at the end of 2000s, in response to a broader movement to go beyond GDP when measuring societal progress. The OECD wellbeing framework encompasses the economic, social and environmental dimension of human development, in line with the original aspiration of the OECD’s Social Indicators Programme of the 1970s. In addition, the OECD work on wellbeing and notably the How’s Life publication proposes a framework for analyzing current and future wellbeing, integrating the notion of sustainability of wellbeing over time and connecting the wellbeing perspective with the broader work on Sustainable Development. Selected findings from the most recent OECD report on wellbeing are also discussed at the end of the article.